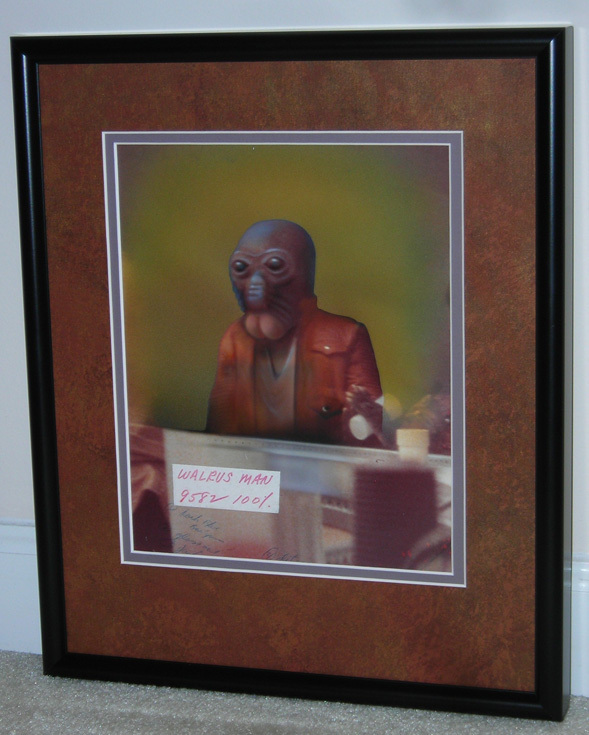 This is the original photograph used by Kenner to create the cardback for the Walrus Man figure. Click here to see the full-sized version. This image of the character remained consistent on the packaging from his introduction as a second series Star Wars figure and lasted through the next two film releases of figures. Kenner even created a Power of the Force Walrus Man for their final series of figures, however it was never officially released during the series. Compared to other figures, this photograph probably had the most extensive work done to it prior to it's use as the cardback image. 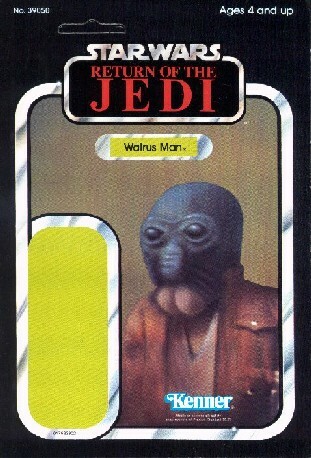 Before the discovery of this photo it was believed that the Walrus Man card image was a piece of original artwork just like the image used on the Anakin Skywalker cardback. The sticker at the bottom of the photo art shows the reference number used as well as the reduction required for the image. In this case, the image was to be used at 100% of the photograph size or "full scale". The handwritten notes at the bottom were cropped by the art agency, but show a partial list of at least four notes on how the image was to be altered. Note #1 looks like it says "dark blue background" and #2 is "glass out" which probably means that they wanted to repaint the entire sleeve, effectively removing the glass and hands of Kabe. Obviously it wasn't done, so perhaps this was too difficult or not necessary because of how the image would be cropped for printing. Note #3 appears to begin with the letters "jack" which probably was in reference to fixing some detail on the jacket. Only the letters "deter" are visible on note #4. Above you can see the image sent from Lucasfilm to Kenner to create this card artwork. It has been airbrushed extensively in order to highlight the character, mask out the background, and even repaint much of the jacket front. Nearly 100% of the figure has been totally highlighted with airbrush painted effects and most of the background has been washed out by even more airbrushing. On the left side of the photo art you can see the the faint image of the bartender remaining. In the movie image behind the bartender you can see Chewbacca's head and over the bartender's right shoulder you can see Ben Kenobi's head. On the right side you can see the mouse alien (named "Kabe" in modern Star Wars books and toys) reaching for a drink off the bar. On the very right side of the image you can see Luke Skywalker. Given the process of moviemaking it's difficult to know if this is a photo taken from the sidelines or if it's from an alternate film angle. 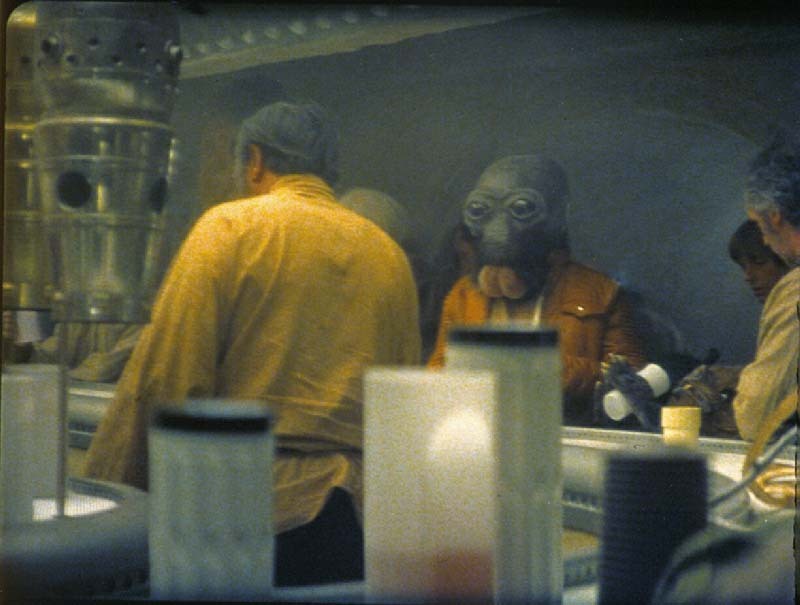 In the movie, the camera is on the backside of the bar as Luke walks past Walrus Man to order a drink. Shown for comparison is a proofcard from the Return of the Jedi series. Comparing it with the original photo art shows just how much of that image was cropped out. 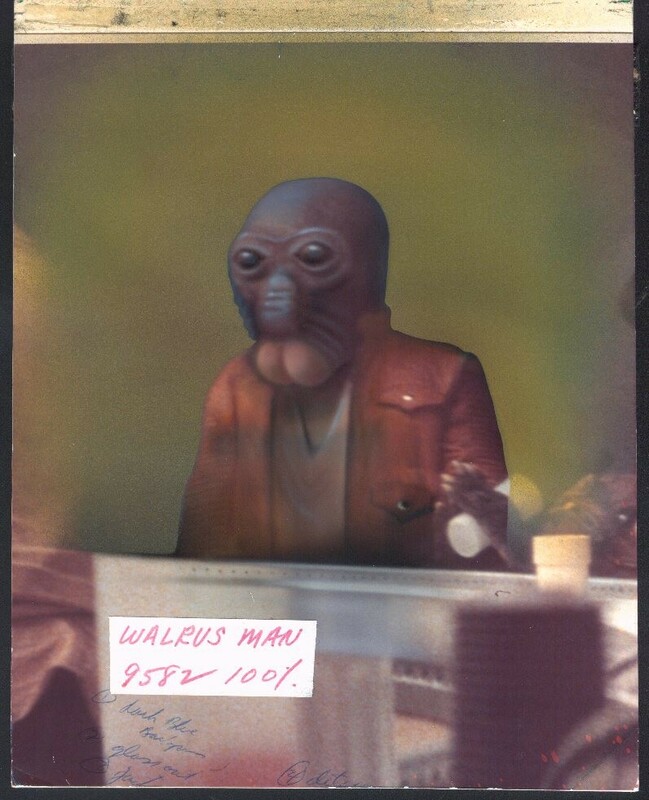 None of the Cantina background can be seen, but if you look closely you will see Kabe's fingernails visible at the bottom of Walrus Man's vest pocket. Without the photo art present, these white elements would probably never have been noticed, much less identified.